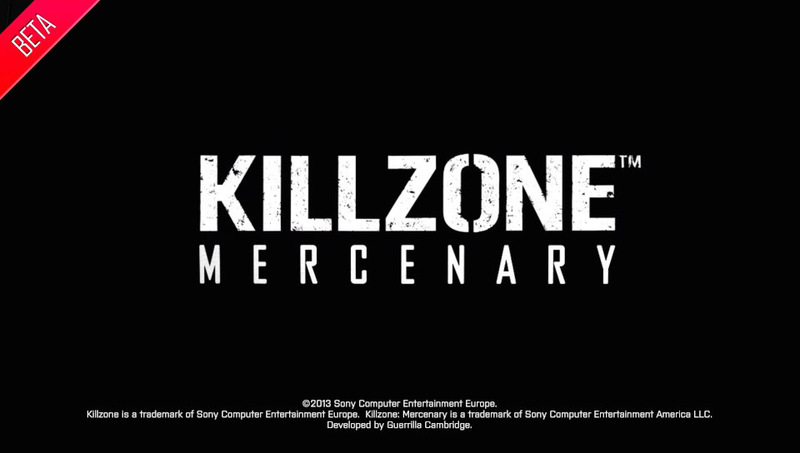 I’ve had the Killzone: Mercenary release earmarked on my calendar for a long while now. 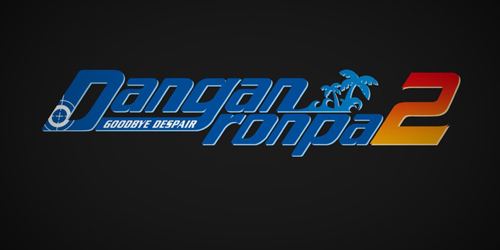 I really loved the first game when it came out on the PS2 and have been enjoying the series since. I’ve drifted in and out of first person shooters for awhile now, none of them really sticking with me as much as Quake II did back in 1997. I ended up getting into RPGs and action games instead, but every once in awhile a game pulls me back to the first-person shooter fray, and usually Killzone‘s name is attached to that. After playing the beta on the Vita I may have just found that love again. 1) I really like the control layout and scheme on the Vita. The touchscreen doesn’t feel tacked on when you’re playing and for me it was a nice integration of the sticks, buttons, triggers and the touchscreen. My only complaint would be trying to find sprint and making sure I wasn’t hitting crouch instead but overall the default look speed was set just right for the Vita analog stick for me. My last real experience with a first-person shooter on a handheld was Star Wars Battlefront Renegade Squadron on the PSP and this is light years beyond that in terms of controls. And for those wondering yes you can remap your controls so it’s all off the touchscreens if you prefer. 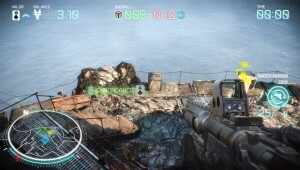 2) The map you get with the beta, called Shoreline, is really well designed. It feels big but doesn’t take long to get around and offers enough terrain, nooks and crannies, and a path to a semi-hidden sniper perch that make this a blast to play through. It’s just the right size for the number of people playing on it and manages not to be cramped especially with all that’s going on. There are a few obstacles like a slow-moving giant fan blade and different tiered perches to get on to along with a ramp set-up that will keep you scrambling. While I wasn’t much for sight-seeing as people were shooting at me, the map does look great on the Vita’s screen. 3) Warzone is the only mode they currently have in the Beta to go along with Shoreline’s map. This is one of the more complicated modes and will take up to thirty minutes to complete. 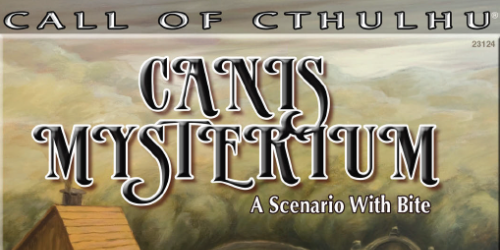 It’s a five-part mission system that gives you random objectives to complete within a short timeframe to get your team more points so you can claim a victory. You still get personal point for taking out your opponent, but if you’re not completing objectives that fit that part of the Warzone your team overall isn’t advancing. While this mode does take a bit longer I like that there’s variety to it and that changes up the tempo of the match quite a bit. 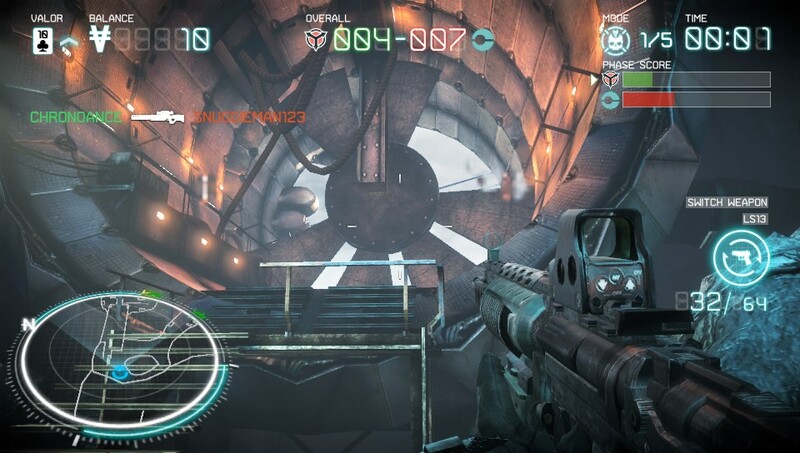 4) You earn money by completing objectives and claiming kills, but there are little bonuses as well. When you take out an enemy, or even if it’s a buddy on the ground, a bounty tag pops up for them that you can claim and get points for that go towards your level and rank and what gear you have access to. You get less points for these as you level up if you’re just getting newer players and get more points from a tag from a more experience player which is nice. If you’re sniping from a good position though it makes it hard to resist dropping down to collect these as they do disappear after a brief time. 5) Gyro aiming, using the actual Vita’s motion controls when you’ve pulled in for a more controlled shot, works surprisingly well. While there have been a few games I’ve played over the years tied to the motion control in the PS3 controller or the Vita or even my phone, few of them have managed to make it work all that well to be honest. They’ve got something with this and while my first instinct is to whip the right analog to aim, the gyro aiming offers a bit more of a fine control to the experience which works better when you’re thinking about it and have a bit more time to aim before pulling that trigger. 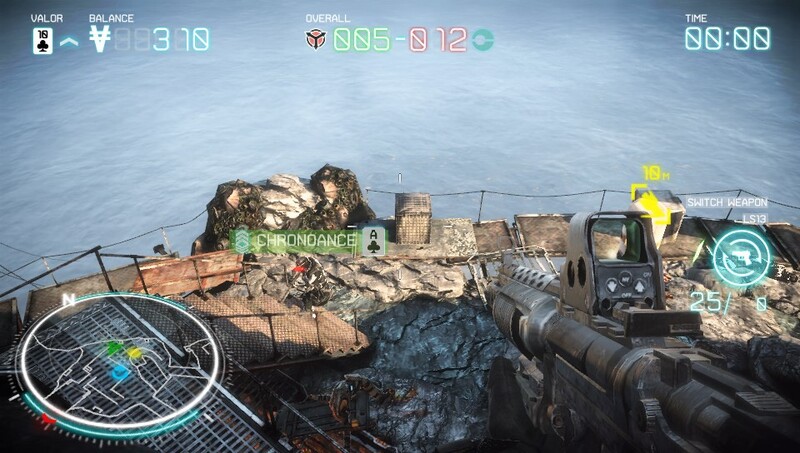 6) Ammo supply is pretty limited to start so don’t expect to spend a whole match perched up above everyone. You’re going to have to leave that lovely spot to resupply. The good news is that ammo isn’t hard to come by and you can grab it from the corpses of fallen enemies readily enough. 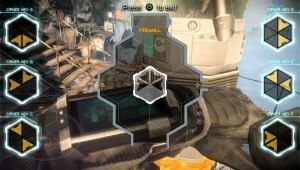 It isn’t automatic and requires you to hit the triangle button to retrieve it, but I like that there isn’t a never-ending ammo supply to keep you moving through the maps. 7) Lag. There wasn’t any. I had my Team Speak server, Netflix was streaming and HD movie, I was downloading a file on my PC, and my wife was running Dungeons and Dragons Online and I got in and it loaded up fine and I didn’t notice any real lag in the match I was running in. If it plays this well with a drag on my network resources as everything except my PS3 is running wirelessly, I should have no problems with the live version. The only time I was left wanting was the load screens and what seemed like an unusually long wait after matches finished, running at 120 seconds. I’m used to matches finishing then getting right back into it. That might be from it being Warzone instead of the other shorter modes and it was looking for players as they filtered in and out of the matches I was in, but it doesn’t tell you that it only shows a timer. 8) I really like the match types change-ups. 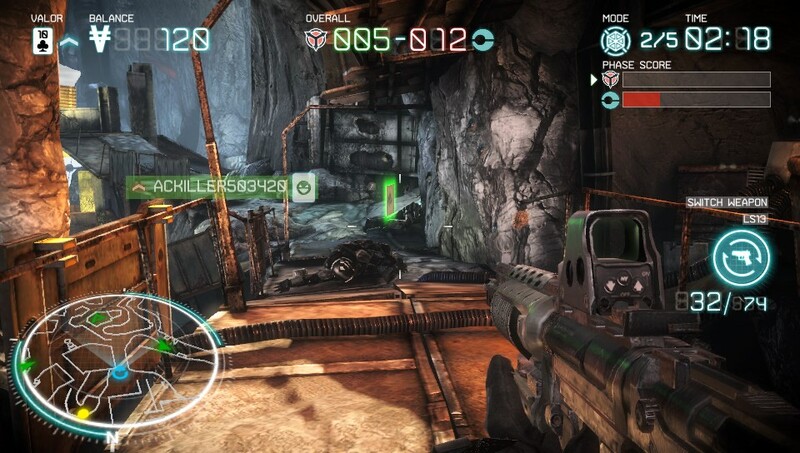 While Bounty Hunter was my favorite, where you have to grab the tags of the enemies you killed before the other team claims them so you can’t to rack up points, I did enjoy the challenge of Hacker. 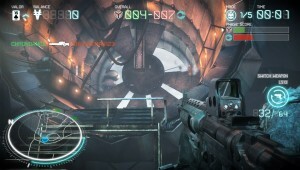 Hacker you have to find capsules dropped at different points on the map and hack into them without getting dead. Most of the matches I played in this led to a draw as the enemy players would wipe you out before you could finish the hack and vice versa. I like the idea of Interrogator but was terrible at not killing the enemy so I could get the information out of them. Body Count was pretty much standard play deathmatch style. 9) This is a bit chunky for a one level multiplayer beta install. We’re talking almost a full gig to download but then a little under a gig actually sitting on the memory stick. People with smaller memory cards like the 4, I have 2 8’s, are going to be scrambling for space if the regular release is much bigger than this especially if there isn’t a physical cart release on this one and it’s digital. I mean we’re talking one map with only some of the features on here for all we can tell. How much bigger is the full release with all the maps and the single player campaign going to be? I’m hoping for a cart to be honest as even though the price has dropped a bit on memory cards I don’t like having to power off to swap between the two memory cards I have already and have game saves on each for the physical game carts I do have. 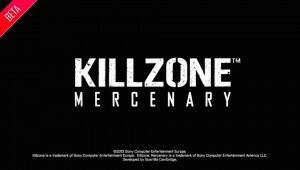 10) While I didn’t pick up Call of Duty for the Vita, partially because I’m not fond of the series and the other part I wasn’t hearing good things and didn’t feel I needed a first person shooter on the Vita, Killzone: Mercenary has changed my mind much like its predecessors. The game plays well in multiplayer, the controls felt smooth, the combat moved at a fairly good clip so I wasn’t sitting around waiting for another player to show up to shoot at and it looks great. If the single player campaign is anything like this I will absolutely love the hell out of this game when it comes out in a few weeks. If you have a Vita and like First Person Shooters, give the beta a shot.